Here is a simple trick to download Flash games from the Internet.If you are searching for games then head over to MiniClips website which has some of the top flash games.Also search the online world to find tons of interesting and addictive flash games. * Save Online Flash Games and Greetings from the InternetOpen the flash game in the firefox browser. * Click on “Tools” from the firefox menu when the game webpage loads completely. * Go to “Page info” which opens a dialog box as shown. * Press the “Media” tab which will list all the components in the current webpage such as images, swf flash files and other scripts if at all they are present on the page. * Click on “Type” which will show the components in a specific order. Select the file, “Save as” and you are done! 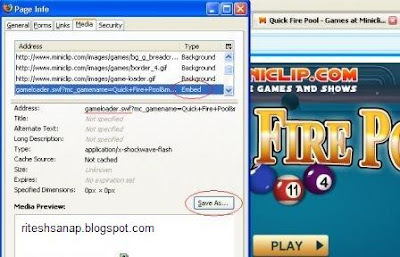 This trick is applicable to some of the basic flash games which embeds swf file to the page.To start saving flash games to play in offline mode you must be using Mozilla Firefox browser.